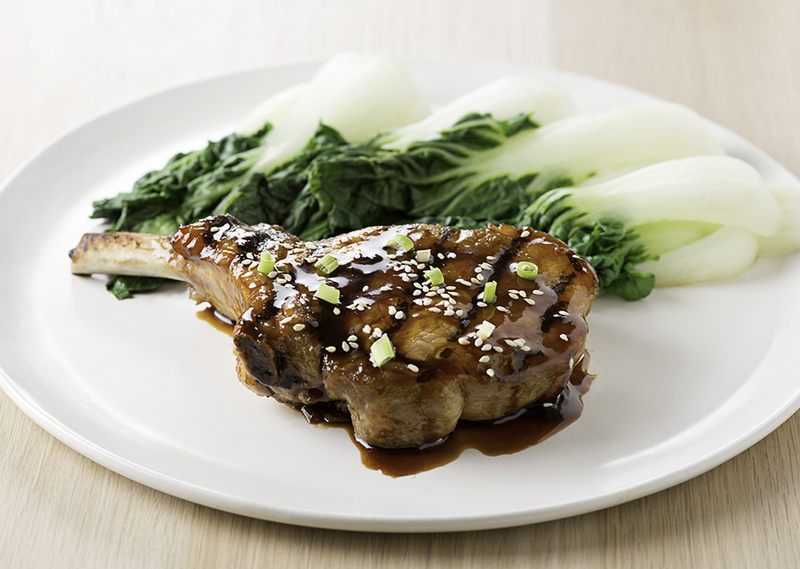 Quickly marinated with ginger and sesame flavors, these Asian-style pork chops are sweet and tangy. Serve with steamed rice and green vegetables for a healthy meal. Stir brown sugar with rice wine vinegar, soy sauce, ginger, vegetable oil and sesame oil until combined. Toss marinade with the pork chops. Marinate for 10 minutes. Remove pork from marinade. Transfer marinade to small saucepan and cook set over medium heat for 3 to 5 minutes or until syrupy and thick. Meanwhile preheat your George Foreman Evolve Grill for 5 minutes with lid closed. Season pork all over with salt and pepper. Place on grill, cook for 8 to 10 minutes or until internal temperature reaches 160°F for medium or until cooked to desired doneness. Brush cooked marinade over pork chops. Garnish with sesame seeds and green onions. Tip: Get your butcher to French the pork chops or substitute boneless pork loin chops, if desired. Note: To "french" a bone means to cut the meat away from the end of a rib or chop, so that part of the bone is exposed.